Whether you specialize in any particular plant or not, the general design and layout of your garden must be pleasing and practical. There are some hard and fast rules to bear in mind, but in the main gardening is a subject upon which it is very hard to dogmatize, and the thing to remember is that the success or otherwise of your garden depends on the pleasure and satisfaction which you get from it. If you have a family perhaps you would like to include a corner for the children, with their own planting plot, a swing and a sandpit, which may be screened and sheltered by a rose-covered trellis fence, a beech hedge, or a shrub border. Try to get the children interested in the garden and feel that part of it is theirs—at least they can have one corner unhampered by restrictions of where not to walk and what not to pull up. It is important that children where possible are given their own garden corner with its attendant pleasures and responsibilities so that they can enjoy the pleasures of growing flowers from seed, and sharing in the awakening of spring with the unexpected thrill of finding the first snowdrop flower, as well as learning care and tidiness. However small your garden, it should have at least one main feature or focal point. It may be an ornamental pool, a summer house, or perhaps even a specimen standard flowering tree. A paved terrace can also be a focal point for radiating rose beds. When you have decided on these features, position them carefully on your plan. Do not forget the compass direction of the facing aspect, the wind, soil or other factors which must be taken into consideration. Try to set off the features naturally with contrasting elements. For example, the pool should be set off by a lawn, the lawn by a border of shrubs and herbaceous plants, and if the pool is of an informal shape, back it with a bank of carefully-built rock stones. There are infinite variations and possibilities. Let the main features show up as focal points in the garden, and then let the lawns and borders provide a neat, simple foil for them, always remembering that you want to keep maintenance work in the garden to a minimum. Keep the lawn as large as is practicable. Besides being much less work to keep tidy than borders which are perhaps too wide, a large lawn will make your garden appear much larger than it really is. If you wish to have an undulating lawn, give careful attention to the drainage of the depressions, or you may have trouble later. Let at least one of your features be as far away from the house as possible so that in attracting the eye to it in the distance you will be making full use of the length of your garden; and do not forget the value of vistas, or framed views, when designing and planting. A white-painted seat or a bed of scarlet floribunda roses are good distant eye-catchers. If the garden overlooks a particularly attractive view between two trees or with a break in a shrub border try to create a framed view just as the painter might do. Another principle to remember is that the garden design is governed more by the architecture and shape of the house than the shape of your plot. The terrace and formal parts of your garden should be planned in relation to the lines of your house. All straight lines of paving or beds in these areas should be parallel to, or square with, the main house walls. Designing and planting the terrace can be important in creating the look of the back of your house. The terrace, or patio, is a connecting link between house and garden. Bear this in mind when.selecting paving for the terrace, so that it will blend with both the house bricks and the garden. Stone is ideal material, but perhaps rather expensive. Nowadays one can obtain good concrete paving in a variety of quiet colors, and often a careful blending of these can give a very pleasing effect. Sometimes a garden may slope down from front to back. This can be turned into an asset by leveling off the paved terrace area, holding up the raised part of it with a stone or brick retaining wall, and building broad steps down to the lawn (this procedure would be reversed should the garden slope down from back to front). Try always to keep your steps, paths and grassed walks wide enough for at least two people to walk abreast. It is also important that steps are always made easily negotiable. Treads should be at least 30cm (1ft) wide and risers (depth of step) never more than 15cm (6in). Let the treads slope very slightly from back to front so that rainwater will easily run off. Under some circumstances a terrace and garden can be made to appear much wider by building the steps to the full width of the paved area. 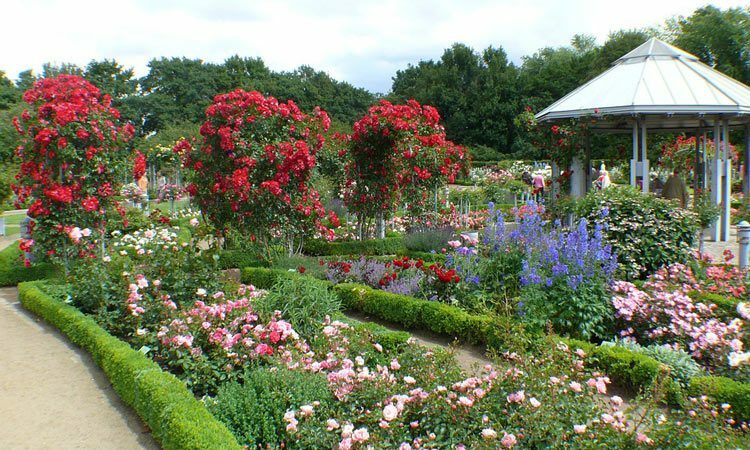 After all, the terrace is part of the garden, and it seems wrong to screen the garden from the terrace with a heavy planting of shrubs and strong-growing floribunda roses, as used to be the custom. For the sake of privacy the terrace may be carefully but effectively screened with walling, fencing or planting. In shaping the lawn with graceful curves (remembering that the lawn mower will have to get around them), you may like to allow for a grassed path through a shrub border at the end of the lawn leading to your kitchen garden, which will thus be screened from the house. To some gardeners a kitchen garden is more important than to others, so that the proportion of your garden devoted to fruit and vegetables is something which only you can decide. It is essential, however, that provision be made for compost and garden rubbish, perhaps in the furthermost corner screened by a hedge. It will save much trouble later if, before any work is done on the actual layout of a new garden, the whole area is first of all forked clear of all weeds and rubbish. As far as the planting is concerned, as many shrubs, roses and herbaceous plants should be included as possible. Not only does this provide a more natural and lasting effect but in the long run it saves labor and expense. Additional color may, if required, be provided by summer-flowering annuals and biennials, but hardy herbaceous perennials, shrubs, and trees should form a permanent backbone to your scheme. Plant your trees and shrubs single and your herbaceous plants in groups of 3 or more. If you have any rose beds plant a variety of rose to each bed; you will find that drifts of one color are always more effective than dotting the colors here and there. Remember that certain combinations of shrubs flowering at approximately the same time look well if planted together; shrubs such as Cornus mas elegantissima, a variegated-leaved form of the Cornelian cherry, with yellow and pink leaves, and Prunus cerasifera atropurpurea (Prunus pissardii), the purple-leaf plum, almond and forsythia ; Potentilla fruticosa and Spiraea bumalda ‘Anthony Waterer’ ; lilac and laburnum. The plan Before you start any planting, or positioning any features, you should draw a plan of your site. One simple way of doing this is to obtain a fairly stiff piece of cardboard about 40 x 25cm (15 x 10in), and on this affix with drawing pins a sheet of clean drawing paper. Now draw the shape of your site, beginning with the actual house itself. This is important because in most cases the angles of the corners of the house are right-angles, whereas boundary fence angles may vary considerably. Where such projections as bay windows are concerned the angles may vary, but details of these can be ascertained. Draw in the house by working around it, putting down details of each wall in succession, remembering, of course, that you are not yet drawing to scale, so that comparisons of such things as length, need not be in accurate detail. Then carry on with the shape of the surrounding fence or hedge, roughly showing any curves or recesses which may occur. If there are any large trees, sheds or any other permanent structures on your site, they should be also drawn in at this stage. While you are sketching, make a note of any view you wish to enhance and any eyesores you would like to remove, so that these can be taken into account when designing your garden. Go along each wall of the house, including each recess, bay, or other projection, putting on your sketch the measurements. When this is completed, carry on with the measurements around your boundary fence. If you have a bay window, the angles of which are not 90 degrees, measure along each straight piece of wall, and, by sighting along the front wall of the bay, measure the distance it juts out from the main house wall. With these details you can determine the angles. In many cases the house and site are not absolutely square with one another, and, therefore, this must be noted on your plan or you will not be able to reproduce a true scale perspective. From each corner of your house draw a dotted line on your sketch until each line (which is really an extension to the line of your house wall) strikes the boundary fence on all sides. These lines are called `siting lines’ and are important to the plan. Now stand along the boundary fence at the point which is directly in line with the wall of the house (ie on the siting line), and take the measurement from that point to the corner of the building. From the point where the siting line meets the fence take a measurement from there to the corner of your site both to right and left. Repeat the measuring on each siting line, and you will see when you are putting down these measurements that any deviation from the square will be accurately noted on your plan. If the plot you are surveying is thick with undergrowth and trees which you would like to leave undisturbed until you have completed your plan, and which obscure the siting lines, you can overcome this difficulty by using a few bamboo canes about 1.3m (4ft) long. Walk as far along the siting line as you can until you reach the tree or other obstruction, and place a cane or peg upright in the ground. Then take a measurement along the wall of the house to a point which would clear the obstruction and place a peg opposite this point exactly the same distance from the house as the first peg you placed on the edge of the obstructing trees. This second peg must also be the same distance from the first peg as the measurement along the house wall from the siting line corner. A line can now be sited between the point along the house wall to which you measured and the second cane which has been placed in position. This siting line will be square with the face and parallel to the side of the house in the same way as the original siting line would have been, and can, therefore, be used as such. You will also find that sitting lines can be very useful when showing the position of existing trees, etc. If a boundary fence is irregular or curved in shape, you can place a series of bamboo canes along the siting lines at, say, 3m (10ft) intervals. From each of these bamboo canes you can then take the measurements to the irregularly-shaped side fence, noting the details on your sketch. You should now have all the details you will need, with the exception of the levels, and any direct variation in these must be noted carefully. The levels are obtained in the following way. First of all shape pegs similar in thickness to bundled fire-lighting wood sold in shops. Let the pegs be long enough to cover the vertical variation in your levels. Now drive into the ground the first peg to the level of the highest point of your garden, and a second peg approximately 2m (6ft) away from the first. Lay a plank of wood approximately 2m x 7cm x 2.5cm (6ft x 3in x 1in) (which must have straight and parallel sides) between the two pegs; and along the top of the plank, known as a ‘straight-edge’, place an ordinary builder’s spirit level. Now the second peg must be adjusted so that the spirit level shows that the top of it is perfectly level with the first peg. This must be repeated over the whole area of the garden so that you can see at a glance the exact variations in levels. These details can be transferred to your sketch by showing the positions of each peg, then taking the first peg as zero, show figures against each of the other pegs in linear measurement so that you have details of variations of levels throughout the site. The measurement shown against each peg will be the actual fall of the ground at that point below the level of the first peg or highest point of your site. To finish off your survey use a simple compass so that you can mark the direction of north on your plan. This will be important because obviously you will want to know which side of your garden will be the warm sunny one, and which the shady side. The design and planting of it will depend largely on these details. Finally, check the quality of your soil. For this it is possible to obtain expert advice. Your County Agricultural Agent can frequently be asked to advise, and, if he thinks it is necessary, he will take away a sample of your soil to be analyzed. From his report you will know what type of fertilizer and how much humus to add to your soil, and it will also give you a guide as to which plants you can or cannot grow. Obviously, the ideal requirements for drawing the plan would be a drawing board, set square, compass and T-square, as well as ruler, pencil, etc. If the former are not available your plan can be drawn quite satisfactorily using pen or pencil and ruler on a piece of graph paper which can be purchased at almost any stationer’s. First of all, decide upon a scale to which to work. This can be determined by adding up on your sketch all the measurements which go to make the longest overall length of your site, and the resultant measurement should then be scaled down to fit the size of your paper. Before you start your plan, write along the bottom whatever scale you have decided to use. Once again start by drawing in details of the house, and when you have drawn that to scale, dot along your sitting line and mark off the measurements as taken in your survey. Now measure from the ends of the siting lines to complete your boundary fences. If you are using graph paper, you will be able to draw quite easily along the horizontal and perpendicular lines knowing that each one is at right-angles to the other, but if you are using drawing paper you will have to rely on your T-square for the horizontal lines and your set square for the vertical lines. At first, all these details should be put down in pencil and not inked in until the planning has been finally completed. Details of the vertical levels can also be marked on your plan. Mark in any existing features, such as trees, greenhouse and shed, show the compass points and details of any adjoining eyesores you may wish to hide and any attractive views you would like to frame. General planning On your plan you have now details of your house and boundary fence, and now you should design the area immediately adjoining the house, back and front. This will include paths and terraces, and the first thing to remember is that paving immediately adjoining the house wall must be laid at least two courses below the damp-proof course of the house. Often crazy paving is the cheapest to buy, but to make a good job it should be laid on a foundation of at least 5cm (2in) of 4:2:1: concrete (ie 4 parts of gravel, 2 parts of sand and 1 part of cement, by bulk), over a 10cm (4in) thick layer of rubble and ashes. If crazy paving is only ‘spot bedded’ (that is, when a trowel of cement mortar is put under each corner of the piece of paving and one in the center) it has a tendency to work loose gradually and cause trouble later on. Where the area of crazy paving is a large one, pieces of paving could be left out and filled with soil, thus forming planting pockets. In each of these pockets, carpeting alpines and dwarf heathers could be planted, thus creating a softening effect on the paving itself and also providing a colorful relief. Natural paving stone is by far the best for garden use, but it is expensive. There are many alternatives, however, which are put on the market as reproductions of natural stone paving. As these are usually made accurate in size and evenly thick they are very easy to lay without unnecessary cutting. The basis of their manufacture is usually crushed natural stone which is mixed with sand, cement and, if necessary, a little coloring. These are much less expensive and they can be most attractive if care is taken with their selection. When purchasing these paving slabs, it is usual to ask for ‘random paving’, slabs of a series of different sizes but all square or rectangular shape. The type of paving slab you are going to use should be considered at this stage as it will depend to a great extent upon the type of paths and terrace you would like. If you are moving into a new house, you may wish to lay paving around the house first to prevent soil being carried inside. A terrace, which should be adjoining a french window or door at the rear of the house, should be large enough to accommodate at least half-a-dozen chairs and a table, and planned in such a way as to ensure as much seclusion as possible. Close-boarded fencing 2m (6ft) high may be erected to give privacy from your immediate neighbors, and trees and shrubs carefully sited to obscure views from other neighboring houses. Any lawn or border lines immediately adjoining the terrace should be square with or parallel to the lines of that terrace. Thus the borders shaping your lawn for the first few yards at least should be parallel to (but not necessarily in line with) the side of your house. Then you could break into more informal lines as suggested in the illustrated plans. These plans are only suggestions as to principles, from which, you will be able to formulate your own personal ideas. Whether you design the lawn on formal or informal lines, make any curves gentle ones to render the task of mowing easier. Sharp curves are much more difficult to mow round. For the same reason, any beds in the lawn should be roughly fish-shaped, broad in the center, tapering to a point at each end, rather than circular, oval or rectangular. Either consult the children regarding their wants in the garden, or at least include for them in your planning. While they are young you may wish to restrict their playing to an area which is more or less in constant view from the house. This may mean that direct access from the back of the house to the front will need to be restricted by fencing and a gate (with perhaps a temporary sand pit and swing erected within view of the kitchen window) to prevent the children from wandering onto the road. As they get a little older a secluded corner of the garden can be allotted to them. This can be hidden from the house by a hedge or a fence and could include individual garden plots, swing, sand-pit, Wendy house, etc. Garden paths should also be planned with the children in mind. They should be wide enough and accessible enough for a scooter or tricycle to be ridden without danger. When sitting the greenhouse and garden shed bear in mind that a greenhouse has to be visited daily whatever the weather, but also that both greenhouse and shed are not the most pleasant of objects upon which to look from your living-room window. Stepping stones through a large rose bed, shrub, or herbaceous border, are both practical and ornamental, allowing access between two or more points and making it possible to tend to the plants in large beds or borders, even when the soil is damp. They can also be used to create an additional walk. It is often desirable to be able to take friends around your garden (however small it may be) by one route and return by another. In the suggested plan of the small garden, you will see that you could walk up the lawn, through the trellis arch beyond the bed of ‘Korona’ roses, across the path between the trellis fence and the kitchen garden and back down the paved garden path. If necessary you could return over the stepping stones from the path to the lawn, all of which must add interest to your garden. When planning pathways bear in mind that paths which are hidden from view from the house can add considerably to the attraction of the garden and even add an air of mystery to it. If you can show friends the whole of your garden without leaving the house, there is no extra inducement (unless they are keen horticulturists) for them to go out and explore it, but if there is a grass or paved path wandering out of sight behind a curved bed or border, there is always the urge to go out and see what is beyond and where it leads. With regard to your front garden and drive, remember that the function of the drive is purely a practical one and that the front garden should be as neat and as plain as possible solely to provide a suitable setting for the house. Most gardeners, however keen, will prefer to spend their spare time in the privacy of the back garden rather than in the more public and overlooked front of the house. When designing your drive, provision should be made for your car to back out of the garage across the front of your house, and then go forward into the road.